We welcome non-members to come sail with us. And then after sailing with us, we encourage you to join the Carolina Sailing Club as members. 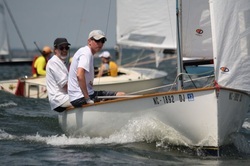 If you're an experienced sailboat racer, then you should join as a member. You can start racing right away. Learn more. If you're new to sailing, you can join as an associate member and have many of the benefits of membership while you learn all about sailing and sailboat racing. Learn more. We encourage you to join our giving leadership by becoming a Commodores Circle or Sustaining Full Member. You can join at our Club Store. You can also print and fill out the Membership Form, attach a check and send it to our treasurer. Click the white button to the right to pay your US Sailing membership directly via the US Sailing local club MVP program. 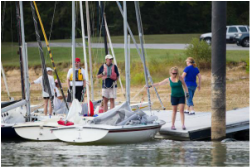 This process will save you 20% on your US Sailing dues and will also benefit the Carolina Sailing Club. You can learn more about the MVP program on the US Sailing site. The Carolina Sailing Club is a member of the United States Sailing Association (US Sailing) and the South Atlantic Yacht Racing Association (SAYRA).